A workbook exploring what a true gospel ministry might look like. Gospel ministry is much more than simply evangelism. It is about shaping the whole of our church life and activities by the content of and imperatives of the gospel. It is about ensuring that our church or group is motivated by and focused on the gospel, as opposed to our traditions, or the scores of other worthy causes and needs that could fill our time. The principles contained in this workbook are an attempt to articulate what a true gospel ministry might look like. They are principles that can be worked out in a range of situations, from Sunday school or youth work to a whole congregation. This workbook is not a recipe for success, but is rather designed to help clarify our thinking about how to be more faithful to God's saving message—not only in what we say, but in how we live our lives as the people of God. Steve Timmis and Dr Tim Chester have years of experience behind them in churches large and small. Currently, they are part of the leadership team of The Crowded House—a church planting initiative which started in Sheffield, UK. I can't give this enough praise. Basic, truthful, searching, reflective work needs to be done here. I did it as a journal, now we are working through it on Sunday mornings and Tuesday nights. I am in a church plant situation, and it is so where we are at the moment. Thanks Tim. Our small group used this excellent workbook and it took us forward in our corporate understanding around mission. One outcome - not entirely due to this book but certainly partially - is that we are reconfiguring the entire group quite significantly around mission (disbanding and reforming to do so). There are 17 chapters in the book which make it quite a long study (probably too long) if you do one per week. As the chapters are short we did two per session for a 9 week course. Gospel-centred Church was recommended to me by a friend in ministry who'd used it for an evening series in his Church. The crystal clear analysis and sheer common sense of the approach that Timmis and Chester take is compelling, while the accessible format they use (backed up with relevant Scripture references) helps convey their message. I would recommend this book to all in Church leadership, whatever your context (mine is Anglican) and yes, I have bought four more copies for others on our leadership team. 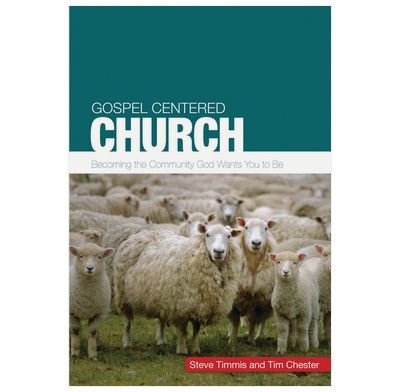 Gospel-Centred Church is excellent - please read this book...and then look to apply it! This book got me thinking (or re-thinking) what a NT church is supposed to look like. The emphasis was not on programs, but Scripture and people -- where a church's focus should be. Although I didn't agree with everything in the book (e.g., Missions is the goal of the church? No, worship is...John Piper, "Let the Nations Be Glad", Chapter 1), it forced me to think outside the box of my own preferences and ask myself, "Is this [my preferences] really what a NT church looks like?" Thank you, Steve & Tim! 'A vision for church growth must be a vision for church planting.' That's what Steve Timmis and Tim Chester say in 'The Gospel-Centred Church.' I'm more than ever convinced that they're right. It’s divided into three main sections (The priority of mission, the priority of people, and the priority of community), and eighteen chapters. So you could take eighteen weeks to go through it with a group. This might feel like a long time, in some groups. However, the chapters are quite short, so you could probably take two chapters per week, and cover the whole book in about nine weeks. If nothing else, this book will make you think about what is essential to church, and what is disposable or tangential.